What Is a Shaker Style Kitchen? 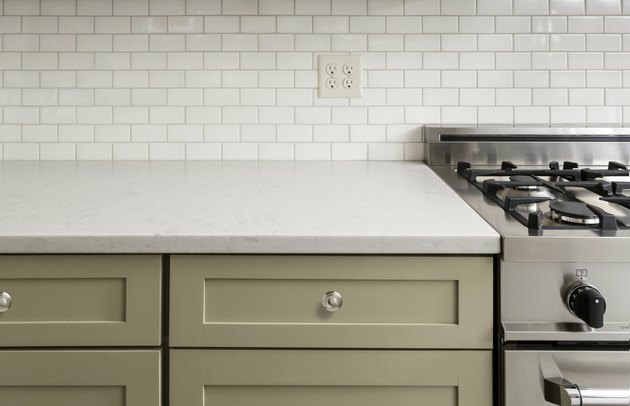 Synonymous with simplicity, understated style and craftsmanship, Shaker design is characterized by clean lines that add depth and interest without being visually overpowering. Innovation and mass market production have expanded Shaker kitchen offerings from native American woods to melamine, MDF and myriad other materials. While the expanded selection and construction methods contradict some of the original Shaker principles of quality, the functional, utilitarian design remains -- the current variety makes Shaker kitchens enhance and work well in contemporary, transitional and traditional homes alike. A contemporary Shaker kitchen focuses on simplicity and clean lines. The Shakers were a religious sect -- founded in mid-18th century England and in existence until the early 20th century -- that shunned materialism. Firm believers in celibacy, they grew their numbers through adoption. Their communities segregated men from women, and featured dormitory-like homes with multipurpose rooms. Cleanliness and durability were important; their furniture designs focused on quality, joinery and standardization. For example, pegboards surrounded rooms and wooden chair backs featured cut-outs so chairs could be hung on the walls when not in use, leaving the floor space available for other activities. Shaker kitchens have become a classic thanks to their clean lines and proportioned frame and inset panel design. Any ornamentation is minimal: a tapered post leg for a kitchen island; a gentle curve to a window valance; a subtle mitered edge to a light valance or crown. Cherry and maple, simply finished with either furniture wax or oil in warm wood tones, were historically popular. Today's Shaker kitchen components are just as likely to be foil-wrapped, painted or stained. Quartz and granite are the first choices today in kitchen countertop materials. A more historically accurate Shaker kitchen would feature soapstone, though it's a softer surface. Counter edges were squared and polished. Flooring was typically varnished wide timber planks or stone, and walls and ceilings were white or off-white. Color was introduced through simple woven fabrics -- gingham or checks, not patterns. If cabinetry, paneling or pegboards were painted, they were in tones available from local clays and plants, such as terra-cotta, earthy pinks, ocher and olive green. Cabinet pulls and pegs were turned wood or hand-forged metal. 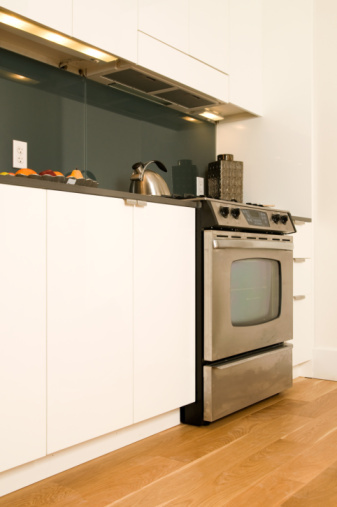 Shaker kitchens easily meld to the style of your appliances, hardware and other accessories. Imagine a simple C-shaped kitchen with a standard slide-in range and hood, French door fridge, dishwasher and undermount sink. Keep it modern by opting for white cabinetry, black, square-edged granite counters, slate floors and stainless steel appliances. Add a glass and stainless steel mosaic backsplash and rod-like cabinet pulls in stainless steel. For a transitional kitchen, install cherry cabinetry and a solid surface marble-look counter with a bullnose edge in warm whites. Keep appliances white or almond. Complement them with a natural stone linear mosaic backsplash, and carry the wood flooring through from the rest of the house. A warm medium-brown finish, with panel doors to hide the dishwasher and fridge, and an intricate crown and light valance will feel more traditional. Large travertine tiles on the floor, installed on a diagonal, and an elaborately veined granite countertop with double-ogee edge in mixed browns can up the elegance factor. Consider oil-rubbed bronze for the faucet, sink, appliances and hardware. A decorator/designer, writer, power yogi, and philanthropist, Christina Mogk has been published in Oceana, Canadian Fabric, for which she is managing editor, and Wedding Essentials. She is the author of the blog, mecc interiors | design bites, and writes feature articles for the professional design community via Décor Digest.